Teaching in the metal studio at the Academy of Arts, Architecture & Design in Prague contributed to the perception of jewelry as an autonomous work of art since the mid-20th century (until then especially connected with mass commercial production). Several distinct personalities emerged from that studio, who formed Slovak visual jewelry, since only from the 1960s did artists began devoting themselves to these creations which are partially exempt from the mastery of crafts. Artists often reached for alternative materials and since then, original jewelry has been considered, not according to the material’s value, but from a purely artistic point of view. There immediately occurred several artistic movements, of which the most prominent was the applied sculptural approach, whereas jewelry was perceived as an individual work of art analogous to miniature sculpture. Its functionality was subordinated to shape modeling and the selected motif stylization. Jewelry was created by sculptors, who were prohibited from officially creating due to political reasons. For example, Jozef Jankovič diverted into the formation of a minimalist expression with his typical dramatically composed figurative displays due to persecution. The jewelry of Dušan Králik has a simple geometric lining of the surface and is often decorated with incised drawings and enamel paints. In Milan Greguš’s work, loosely modeled, golden and silver objects (curtains) dominate, with traces of a manual material shaping decently decorated with pearls or gemstone. Erna Masarovičová was stylistically dedicated to a sculptural jewelry with a particular signature. Initially, she formed planar square pendants made from copper with an ornamental composition of geometric elements, circles, spirals and waves. She later used material from silver cutlery formed through clipping into stylized figurative or abstract shapes with a relief modeled by simple interventions. In her work a certain robustness and traces of craft work with a saw, chisel or file is noticeable. However, a gradual improvement in technical skills led to increasingly more complex compositions, the development of spatial and shape feelings as well as the content of objects. The early jewelry of Alina Ferdinandy is formed from English tin cast into a gypsum mold. She later worked with silver poured into seawater sepia, thus forming a single original with a miniature painting with the structure of the natural material. She also experiments with layered polystyrene. Her jewelry has the distinctive character of relief Informel plastic constructions and later stylized vegetative motifs. In compositions she prefers the geometric creation of motifs, perforation, accumulation and overlapping shape details in rhythmic gradation. A new element is the involvement of technical components, gearwheels and rings, forced into the mold and cast. As a result of the seemingly chaotic arrangement of elements there is surface minimization and a release of the outline of three-dimensional compositions. They are overlapped with abstract geometric and crystalline elements, the metamorphosis of plant motifs, enhanced by inserting grinded gemstones and stained glass. The opposite pole is represented by objects of a geometric-constructive character, reacting to the progress and technological advances of today’s society. The most prominent personality of this tendency is Anton Cepka, who influenced generations of followers charmed by the cool aesthetics of a mathematical precision and the precision of form processing. The pure geometric form elements with exact compositional structure from metal were initially shaped through perforation, buckling, punching, engraving, beating and filing. Individual elements were often combined in several layers one above another, to achieve the plasticity of structure and the spatial effect of jewelry. He distorted their continuous contours through cuttings, layering and the layering of various components filled with color accents. Another moment of his creation was kineticism and the preferring of compositional dynamics highlighted by inserting an optical lens and colored stone. He found inspiration in the world of current scientific and technological progress, in the aviation field and astronautics. He created a system of basic geometric forms, which according to the hand-drawn drawings, are transferred into subtle structures by means of a filling technique. An important element is also the motif of precisely crosscut lattice with net patterns in op-art poetics. Individual segments of air lattices, vibrating wings, various technical and mechanical components are combined in multiple levels and thus add a spatial dimension and unique artistic expression with a timeless value to jewelry. An appreciable group consists of jewels of various types of ground glass in combination with metals. The simple shapes of jewels, especially drapes with a decorative character, abound with optical, lighting and colored features. The innovative material and artistic way of thinking of these artists places them in the unique position of being a local phenomenon even today. Thanks to Václav Cigler, whose design and solitary production in this medium ranked in the study program in the glass studio at the Academy of Fine Arts and Design in Bratislava, his students devoted themselves to jewelry. (Askold Žáčko, Pavol Hloška, Tamara Kolenčíková). A precise craft accomplishment, sense of design and balanced proportions is characteristic for the educated jeweler. Imrich Svitan’s work is characterized by the composition of larger, finely modeled surfaces with quite a massive shape, clear contours and by an emphasis on the color contrast of used materials such as slate and silver. Peter Mišík tends towards traditional goldsmith techniques (granulation, filigree). Ondrej Ďurian creates mutely-angle jewelry compositions supplemented by ground gemstones and Marcela Korkošová composes jewelry with strictly geometric volume composition evoking architectural details. A unique phenomenon is the creation of Jana Cepková, who uses an enamel technique. Jewelry with a significantly epic motif accented by a poetic art abbreviation and with a deeper philosophical purpose is processed into various types. Their form oscillates from abstract to a particular form of archetypal figure. Alexander Česla also deals with a colored enamel technique. He most often adorns drapes and brooches with simple geometric or precise vegetal ornaments. Remígia Biskupská creates jewels inspired by plant motifs of spin-bonded silver or copper wire with the application of gemstones. Jozef Lupták combines silver with ivory and bones in a softer more lyrical line. Natália Mudrochová forms large decorative free forms from silver often decorated with incised linear drawing. A period of the 1980s was marked by the influence of postmodernism in artistic jewelry creation. Jewelry in relation to the human body gained a new dimension of mutual dialogue, an idea becoming the purpose of jewelry. A feature of an unconventional approach in creation was the rediscovery of figurative displays, convergence and individual artistic scope penetration, style mixing, citations of old art and the art of exotic cultures. 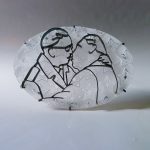 Postmodern jewelry was associated with a story, in which wit and irony, fiction and illusion, paraphrasing or parody on conventional, hitherto tabooed symbols relating to the nation, religion and sexuality are not lacking. Artists from various departments became jewelry artists: Daniel Brunovský – painting, Jana Černá-Korkošová and Zuzana Graus Rudavská – sculpture, Kata Kissoczy – state management, Karol Weisslechner – architecture, Aleš Votava – state management and Karol Pichler – textile. In the sphere of artistic jewelry, many textile female artists established themselves. Silvia Fedorová applies traditional bobbin lace technique in a new manner. Ildikó Dobešová and Katarína Ondrejková use textile techniques, applied metal fiber in combination with other materials to implement spatial objects, accessories and jewelry. Blanka Cepková creates tiny jewels from textile and metal threads through a crocheting technique. She shifts from the early subtle objects with a circle motif to free up three-dimensional forms of poetic reality characters inspired by nature or the human figure. From the initial captivation over the course of several years, a systematic interest in jewelry was developed especially with Daniel Brunovský and Karol Weisslechner. The brooches of Daniel Brunovský are fragments of landscape and space, the heads of birds and insect bodies, laurel leaves and leaf flowers. Karol Weisslechner’s jewelry forms a “landscape architecture of the body”. His expressive means are experiment, irony, not respecting the boundaries of media and the assembly of noble materials with the cheap. Already after graduation, he devoted himself to the formation of free dimensional objects and installations inspired by postmodern principles and the jewelry realizations of the geometrical shapes of light structures, often with light effects. He formed jewelry from paper, plaster and stucco matter at the beginning of the 1990s. Relatively bulky jewels with perforated walls hide inside other small objects or colored pigments. 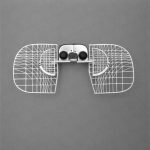 In the subsequent period, there was an apparent interest in the conceptual notions of jewelry and objects in his works, dealing with current societal issues. He gradually improved the skill of craft by working with metal. The jewelry scale decreased and the expression varied, conditioned by architectural space building and used material – silver, plastics, dental material and ground precious stones, along with human hair and fur. He thematically followed verified and still actual themes of physicality, sensuality, eroticism, encrypted intimate references and relations’ symbolism. 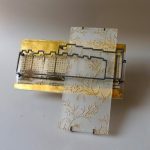 Through his inventive and creative work with a sarcastic subtext and multi-intermedia overlapping he introduced the new formulation of interpretation and presentation in the jewelry field. He also significantly shifts the understanding of the original authorial jewel as a free agent of the fine art artifact with a timeless message. Overall, the 1990s was a cumulative period for jewelry development, which significantly strengthened this discipline in the context of other fine art disciplines. Diverse competition supported and popularized design in the shape of a minor applied subject. Differentiated material and technological alternatives exempt from dependence on the function of the object allow artists to solve completely different issues concentrated on the context of the content and the form of art work today. Jewelry borders are not limited. With the onset of a younger generation of artists, there was a more intensely manifested interdisciplinary character of the medium and an overlapping into free art and video art, product design and graphic design also being frequent. Jewelry as a liberal medium drew from experimental and craft traditions in equal measure. A powerful concept dominates Sylvia Jokelová’s work, which is based on linking hobby, women’s work and design, re-evaluating, criticizing and polarizing with the current status of women – designer. She was one of the first artists to bring the aesthetics of ugliness to jewelry and design with the direct referencing of regional history and current popular narrative clichés. Bety K. Majerníková’s work presented themes of origin issues, originality, while deliberately confronting local traditions with global trends. She used to apply a variety of techniques and materials that she mutually interconnected as well as applying a variety of non-jewelry techniques. She distorted the multilayer surfaces of objects by engraving, scraping and perforating. She was often inspired by personal experience, operating with private archival material, mocking and criticizing societal conventions. Kristína Hrončeková shifts the boundaries of perception of fine art jewelry and its skills in communication with textiles or felt. Her creation is connected with authorial mythology and personal ritual. In his work Matej Bezúch expresses a critical opinion on political culture, mass manipulation by advertising brainwashing and consumer society, dependent on the Internet as a global tool of communication and education. It is possible to plug in his jewelry to a computer, for example, via a USB port and thus automatically come alive and reveal its message. 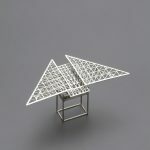 Several artists are now focused on the reproducibility of jewelry in terms of design, nowadays others achieving expression in original jewelry by using classic and new techniques. Lucia Bartková uses digital technologies and 3D printing in her creations; Andrea Ďurianová creates reproducible jewelry designs in limited editions. Jana Machatová presents precision in working with metal as well as personal or national stories in jewelry in comparison to Lucia Gašparovičová, who prefers conceptual jewelry with a high quality of craft. Tatiana Warenichová offers an interesting paper processing. The young generation of graduates from the jewelry studio of the Academy of Fine Arts and Design in Bratislava present themselves as good prospects for authorial jewelry (Katarína Siposová, Pavol Prekop, Slavomíra Ondrušová, et al. ).